This is one of the best little gadgets for your garden. These Quick Connect fittings are easy to install, and they make outdoor watering quick and easy. No more twisting and turning to install or remove hoses and nozzles. And forget about running to the faucet to turn off the water before you switch from spray nozzles to sprinkler. With these installed, it's so much easier to connect and disconnect your garden hose and other watering accessories. To connect just press together until it clicks into place. Removing it is just as easy. Just slide back the collar on the female side of the Quick Connect fitting and then slip the male end out. The built-in water stop allows you to switch from sprinkler to nozzle and back again, without running to turn the water off and on each time! The water flow will shut off automatically when the fitting is separated. You get the rustproof durability of super strong plastic construction, and an instant-on, instant-off coupler. 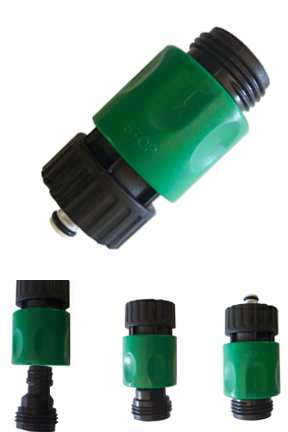 The garden hose Quick Connect will work with all of your standard garden hose fittings and nozzles. Buy more and save more with our quantity discounts. Make backyard watering easy and hassle free with these great garden hose fittings. This easy-to-use device is perfect for anyone and will work on any standard size hose. It is perfect for switching accessories or moving your hose from one faucet to another. Just slide the ring and pull the fitting apart to separate. It is easier and takes less time than twisting, plus you don't have to worry about it seizing in place or rusting with use. You can even change accessories without turning the water off. A unique auto shut-off valve stops the flow of water as soon as the fitting is separated. With the Quick Connect you can save time and make watering easy. Order Yours Today! Dimensions (l x w x h) 1.25" x 1.25" x 2.5 "
Quick Connect Hose Fittings - The best way to connect your hoses. This unique little gadget makes it quick and easy to disconnect your hose or switch nozzles. Just slide the ring and pull apart. Also has an auto shut off valve to stop the water when the fitting is separated. This was the item I was looking for, priced right, and the service was excellent. Thank you IO will be ordering again from you. QUIK HOSE CHANGE A SNAP!!!!! No problems attaching to hoses and sprinklers- even when its 103F outside in the shade, NO fumbling, or bad language. Try 'em. in changing types of equipment I need more males than female fittings, can I buy these separately ? Unfortunately, no. The two parts are packaged together, so we are only able to sell them as a set. I have it connected, but no water is coming through it. there were no instructions on the packaging so I wonder what I'm missing?. It seems easier enough. If you only have one half connected, that would be normal. Both parts, male and female need to be connected for water to flow through. Please call us for more help if you need it.